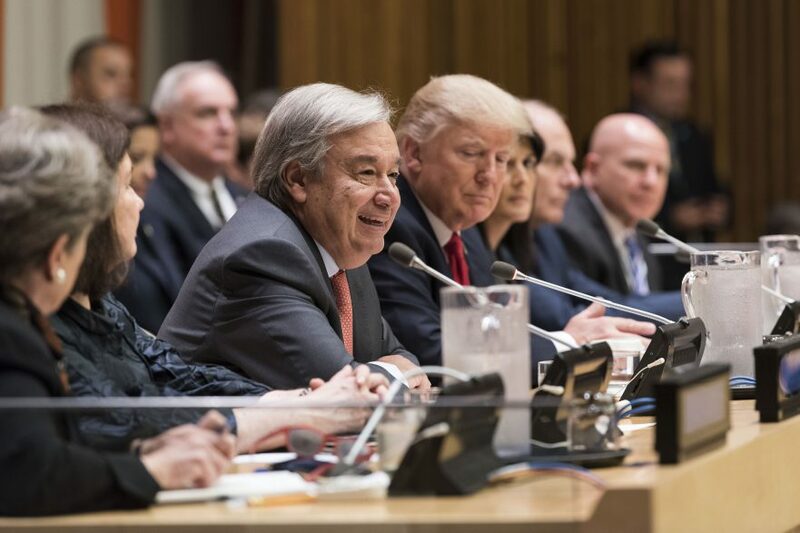 Almost immediately after taking Office in January this year, UN Secretary-General Antonio Guterres announced his intention to introduce wide-ranging reforms to the way the UN works and how its delivers on its mandate. By and large, those reforms have been warmly received by States, civil society, and the press. Indeed, on 18 September, during a high-level event on UN reform held on the margins of the UN General Assembly (GA), over 120 States signed a ten-point political Declaration expressing their commitment to the Secretary-General’s reform agenda. Even US President Donald Trump, not known for his enthusiasm for the multilateral system, has aligned his Administration in support of the reforms. But what are those reforms and what are their likely implications for the UN’s human rights pillar? The Secretary-General has also been very clear about his approach to reform: that it should be guided by the need to reduce and eventually eliminate ‘the horizontal and vertical fragmentation between the pillars of UN work’ (e.g. between the UN’s ‘peace architecture’ covering prevention, conflict resolution, peacekeeping, peace-building, and the UN’s ‘long-term development’ work). Instead, the UN should deliver a country-orientated service, which understands that, for example, sustainable development and capacity-building are essential prerequisites for building national resilience and preventing conflicts. Thus far, he has focused, in particular, on reforms across three areas: UN management (Secretariat); the development system; and the UN’s peace and security architecture. The Secretary-General has assigned three ‘different internal review teams working together’ to lead on each of these areas of reform. In July, the Secretary-General held a ‘Town hall’ meeting with UN staff to introduce the key parameters of his management reform plans. A contract between the Secretary-General, department managers, and structures in the field. He envisions a ‘massive’ delegation of authority to the field, with a condition of transparency and accountability. This transfer will require preliminary testing and capacity-building. He aims for an effective decentralisation of the Secretary-General’s responsibilities, in order to take resource management decisions more quickly. A contract with UN Members States, who over the years have developed a system of micromanagement through the GA and the Fifth Committee. He currently can’t move a post between duty stations or between services without going through the Advisory Committee in Administrative and Budgetary Questions (ACABQ) and the Fifth Committee. Mr Guterres will thus ask States for more freedom with some rules (e.g. no transfer of resources between pillars, concerns of regional diversity, plus transparency and accountability mechanisms). One charged with policy, compliance, governance, and oversight. This would define the rules, manage the global budget, coordinate the delegation of authority, and ensures oversight. Another charged with operational support services, focused on the on-the-ground deliver of the UN’s mandate. This decentralisation would aim to ensure the efficient implementation of UN policy without having to constantly refer back to UN headquarters. Regarding reform of the UN’s development system, Mr Guterres has called for ‘bold changes’ in order to support the realisation of the Sustainable Development Goals by 2030. In July 2017, he presented a report to the UN’s Economic and Social Council (ECOSOC) on ‘Repositioning the UN development system to deliver on the 2030 Agenda – Ensuring a Better Future for All,’ in which he presented some initial priorities, strategic guidelines and proposals for reform. Assigning Deputy Secretary-General Amina Mohammed to oversee the UN Development Group (UNDG) and lead a steering committee to strengthen coherence between the UN’s humanitarian and development sectors. Enhancing the effectiveness of UN Country Teams (UNCTs) and ‘delinking’ the functions of UN Resident Coordinators (RCs) from the UN Development Program (UNDP). This important proposal responds to the long-standing criticism of the UN Resident Coordinator system: that RCs have come to be seen – and often to act – solely as representatives of the UN’s development pillar and of UNDP, rather than representatives of the UN as a whole and of the Secretary-General. Decreasing the number of country-level offices, while strengthening the UN’s regional offices. Reviewing the funding process and progressively improving donor State oversight. Regarding the overarching goals of the proposed reforms, the Secretary-General notes his wish to: prioritise prevention and sustaining peace; enhance the effectiveness and coherence of peacekeeping operations and special political missions; make the peace and security pillar more coherent, nimble and effective through a ‘whole-of-pillar’ approach; and align the peace and security pillar more closely with the development and human rights pillars. The creation of a Department of Political and Peace-building Affairs and a Department of Peace Operations. The creation of a single political-operational structure under Assistant Secretaries-General with regional responsibilities, reporting to the Under-Secretaries-General for Political and Peace-building Affairs and for Peace Operations. The establishment of a Standing Principals’ Group of the Under-Secretaries-General for Political and Peace-building Affairs and for Peace Operations, under the Secretary-General’s chairmanship. The enhancement of certain priority areas to ensure coherence and coordination across the peace and security pillar. The introduction of several non-structural changes in the way the peace and security pillar works on a daily basis. As has been noted elsewhere, the human rights pillar is notably absent from the Secretary-General’s reform plans. This omission may of course reflect a belief, on the part of the Secretary-General, that the human rights pillar is working perfectly and thus does not need to be reformed/improved – although this would appear unlikely. A more probable explanation is that the human rights pillar – and indeed the concept of human rights itself – is not viewed as a priority by the Secretary-General. If this is indeed the case, it has deeply negative implications for human rights, but also – it must be said – for the Secretary-General’s overall reform agenda. As already noted, the Secretary-General’s reforms are premised on the need to reduce and eventually eliminate ‘the horizontal and vertical fragmentation between the pillars of UN work.’ However, when spelling out what that means in practice, the Secretary-General (e.g. in his speech to the Town hall event with staff) speaks only of eliminating barriers between the ‘UN’s peace architecture’ (i.e. its peace and security pillar) and its ‘long-term development’ work (i.e. its development pillar). The problem is, by side-lining or ignoring the human rights pillar in his equations, the Secretary-General is de facto making the achievement of his headline objectives – greater UN-wide coherence, especially at country-level, a heightened focus on prevention, a consistent drive the support the implementation of the 2030 Agenda for Sustainable Development – practically impossible. Prevention (in its broad sense) is simply impossible without a focus on building the domestic human rights resilience of States (e.g. through human rights capacity-building), and without a UN human rights system that is able to rapidly collate, analyse, and act upon early warning information about emerging patterns of human rights violations. Likewise with sustainable development, a recent study by the Danish Institute for Human Rights has shown that over 90% of the SDG targets are directly anchored in international human rights instruments and heavily dependent on domestic human rights progress (i.e. progress with the implementation of States’ human rights obligations). On a few occasions the Secretary-General has recognised that his drive to improve coherence and on-the-ground delivery must involve the human rights pillar. For example, in his report to the GA on ‘Restructuring of the United Nations peace and security pillar’ he acknowledges one of the key objectives of his reforms is to ‘align the peace and security pillar more closely with the development and human rights pillars.’ However, such occasions appear – for the moment – to be the exception rather than the rule, meaning these much needed reforms designed to bring greater UN wide coherence, are in themselves incoherent. The Secretary-General introduced his Management Reform Initiative to the Secretariat staff at a Town-hall meeting held on 26 July 2017. Available at: http://u-seek.org/wp-content/uploads/2017/08/SG-Townhall-26-July-final-1.pdf. Secretary-General’s statement to the ECOSOC, 5 July 2017. Available at: https://www.un.org/sg/en/content/sg/statement/2017-07-05/secretary-generals-remarks-economic-and-social-council-repositioning. Economic and Social Council, Repositioning the UN development system to deliver on the 2030 Agenda : ensuring a Better Future for All, Report of the Secretary-General. A/72/124-E/2018/3, 11 July 2017. Available at: http://undocs.org/A/72/124. United Nations, A Capacity Study of the United Nations Development System. Volume I, document DP/5, Geneva,1969. General Assembly, Restructuring the United Nations peace and security pillar, Report of the Secretary-General. A/72/525, 12 October 2017. Available at: http://www.un.org/en/ga/search/view_doc.asp?symbol=A/72/525. See ‘The missing human rights chapter in the Secretary-General Guterres’ strategic priorities’ by Dr. Bertrand G. Ramcharan published on the Universal Rights Group blog. Available at: http://www.universal-rights.org/blog/missing-human-rights-chapter-secretary-general-guterres-strategic-priorities/ . Feature photo: High-level Meeting Convened by United States on UN Reform, 18 September 2017, New York. UN Photo/ Licensed under CC BY-NC-ND 2.0.